Quite awhile ago I got the following question from Diane C.
I love your site, but have been looking for some tip on avoiding neck pain while appliquéing by hand. Am I the only one who has this problem? Diane, I feel certain that you’re not! I’ve been on the lookout for some good information from you. First I’ll chime in with my own very non-expert two cents worth. • Make sure you can see well. If you wear glasses, get your prescription up to date. • Good lighting goes hand-in-hand with good vision. Make sure you can directly illuminate your appliqué. • Support your work. 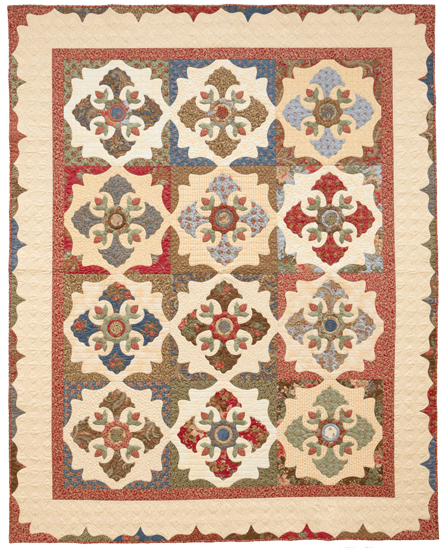 I use the cushioned side of 12″ quilter’s pressing/cutting mat. I also put my feet up on a footstool. • Warm up your neck, shoulders, and arms with standard stretching and rotating exercises. • Break your appliqué up into shorter stints. Sew a little, get up and do something else. Sew and little, get up and do something else. • Stop stitching the minute you feel strain. Get up and do some gentle reverse stretching. So that’s what comes to my mind. Now let me direct you to a great post over at Stitch This!, the Martingale blog. It’s written for the knitter, but the information will work for any type of stitching ergonomics. Okay that makes it sound like I have a football team standing around in my kitchen getting ready to peel me a grape. 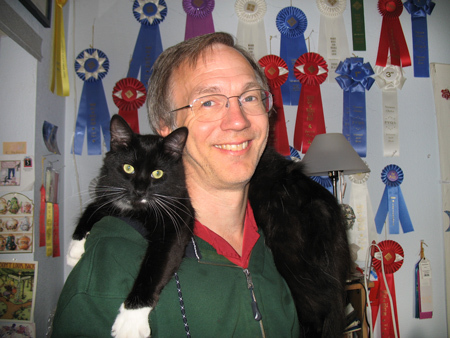 The truth is, there are only two hunks in my life, my (actually rather skinny) husband of 23 years, Dana, and our strapping young tuxedo cat Max. My next-door neighbor at Festival in Long Beach was DeNiece of DeNiece’s Designs, inventor of the Fabric Organizer. This Texas gal was a hoot and a half and we had a great time being next to one another all weekend long. I decided to bring home some of the organizers to see if I could wrangle some sort of better order into my big hunks. I got eight of the Small size, 5″ x 14″. 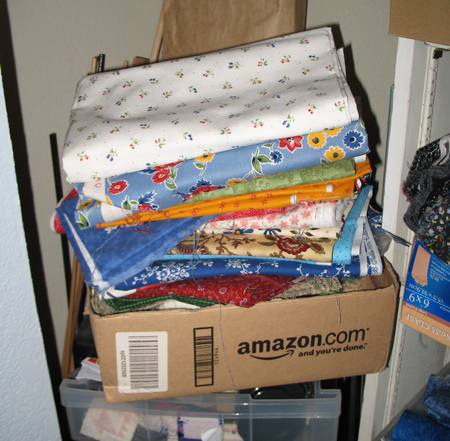 It was fun folding and wrapping the lengths onto the organizers, which BTW are acid-free. 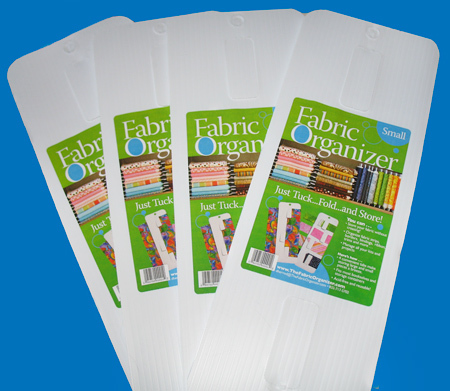 The organizers have push-out tabs to secure the leading edge of the fabric. 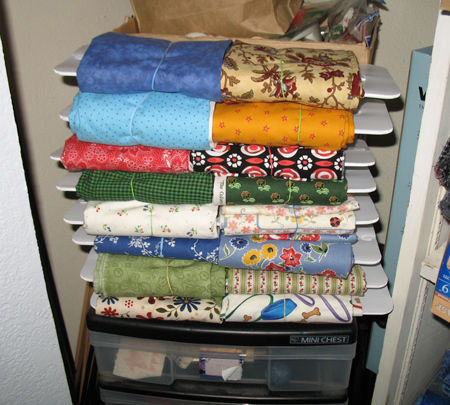 By folding the fabric into eighths, (5-6 inch widths), I was able to get two onto an organizer, and secured them with rubber bands. A lot better now, don’t you think? And these little almost like mini-bolts fit right back into that little wedgy space in the corner of the stash! Now I can see what I have without rummaging. Very satisfying. There are a lot more uses for the organizers, and different sizes to fit different needs. You can find out more at TheFabricOrganizer.com. Today I am utterly delighted to turn the blog over to Iris Frank, contributing editor to American Quilter magazine, friend, and and current president of my home guild, PVQA. Iris has a wonderful Show & Tell for us. Take it away Iris! 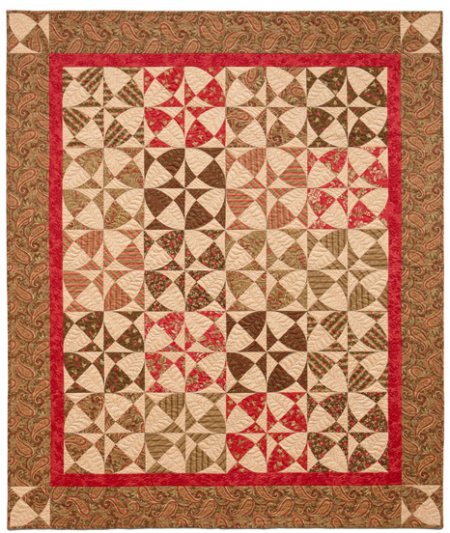 Marina Rosario was a member of our PVQA Small Quilt Group and is very accomplished appliquér. She was such a loss when she left the area and we still talk about how much we miss her and her inspiration. 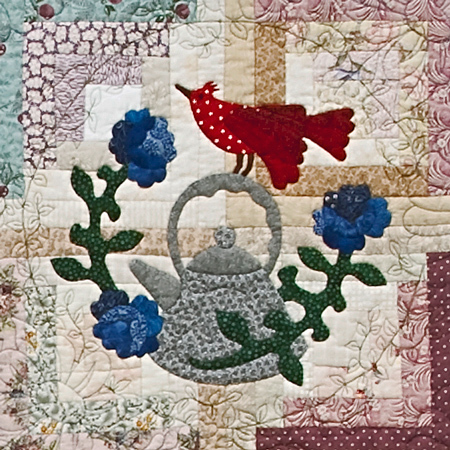 The year after she moved to Oregon, Marina sent me a quilt entitled Tea is for the Birds for entry in our local annual PVQA Quilt Show. 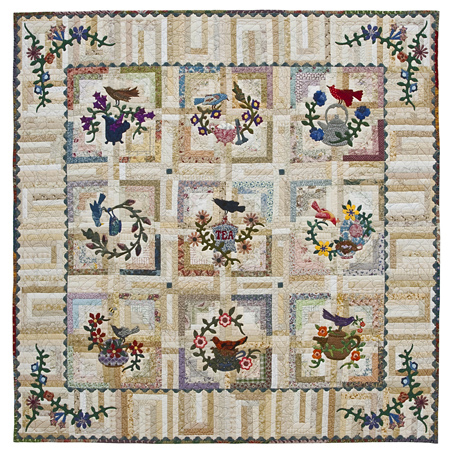 I’m an avid feeder of backyard birds and the minute I opened the box and saw the quilt, I fell in love with it! I emailed Marina to ask if she would consider selling it. Her reply was, “Oh, no, I spent over a year making that quilt.” After the show, I was asked if I thought Marina would consider letting the quilt stay in Santa Cruz for a couple of months so it could be used as a decoration for the upcoming UC-Santa Cruz Mother’s Day Tea, since it was so perfect. Marina agreed and I had the privilege of enjoying the quilt for the intervening time period. After the tea, I emailed Marina to let her know I was packing it up to return to her and begged her again to sell it to me. To my delight, after explaining her cats would probably just use the quilt as their bed anyway since she didn’t have enough wall space to hang it, she guessed she would let me purchase it!! It’s currently decorating my living room wall and everyone who sees it has a positive comment about it…the design (a Marina original) is wonderful and the workmanship is absolutely exquisite! And I love it!! I love it too! What a masterpiece. Good news! 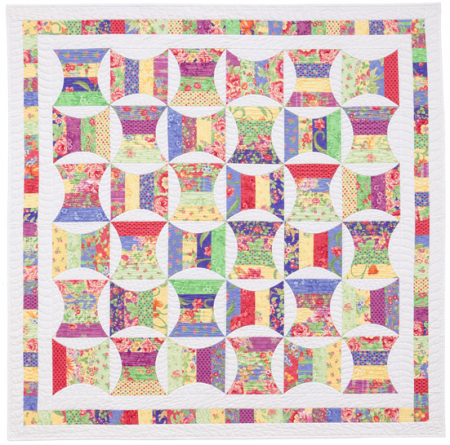 All nine block patterns are available in Marina’s Runs With Scizzors Etsy shop. Here are a few closeups for your enjoyment. 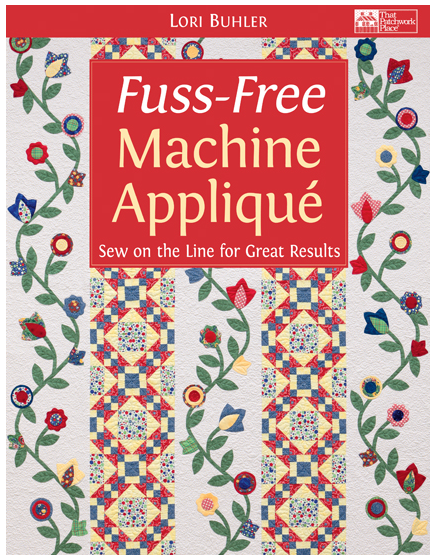 The winner of Fuss-Free Machine Appliqué is Glynis B. of Duncan, British Columbia. Congratulations Glynis! Enjoy the book. 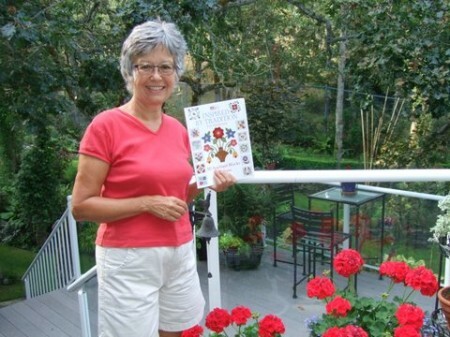 Glynis sent me a photo of herself with my book Inspired by Tradition. How sweet! I was so glad to hear that she is enjoying my designs. On to the This and That. There’s a Pets on Quilts show going on right now, hosted by Lilypad Quilting. This internet quilt show features real pets on quilts, pets depicted on quilts, or any combination thereof, so what a happy topic. Joanna, who blogs at Needle Thread Happiness, used two of the cat patterns from my book Easy Appliqué Blocks to depict her gorgeous black cat Moxie. And in the post Moxie herself inspects the results LOL! Joanna also shows her very cute version of Lollipop Grove (the cover quilt for Scrap-Appliqué Playground) with a little dog frolicking in the trees. What a great idea! 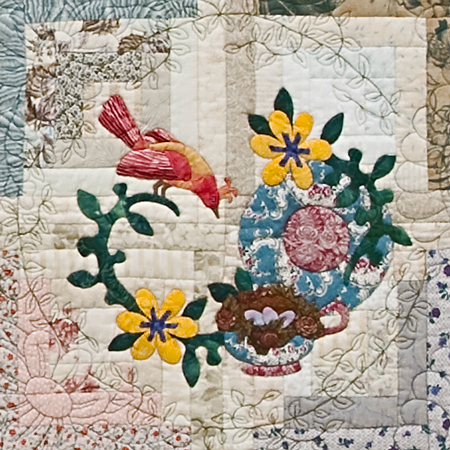 Thank you Joanna, for including my patterns in your Pets on Quilts entry. I really enjoyed them. I got a nice little surprise while I was in Long Beach… the Martingale blog Stitch This! did a feature on different ways to label your quilts, and lo and behold up popped the information I included in Scrap-Appliqué Playground on how I make labels. There are lots of other great ideas too so be sure to check it out. If you’re like me you’re always interested in finding out more about how other appliquérs go about things. I was very intrigued to read up on the method that author Lori Buhler gives in her new book from Martingale, Fuss-Free Machine Appliqué: Sew on the Line for Great Results. Aha! So that’s how you can sew on the line! It’s all done by machine, stitching on lines that are marked on the interfacing. Very cool. I’ve done a fair amount of this method with fusible interfacing; Lori uses a non-fusible product and pins the shapes in place for stitching. Here are some of the stunning results she gets! This beautiful book gives full information on the interfacing technique, as well general quiltmaking and finishing instructions. 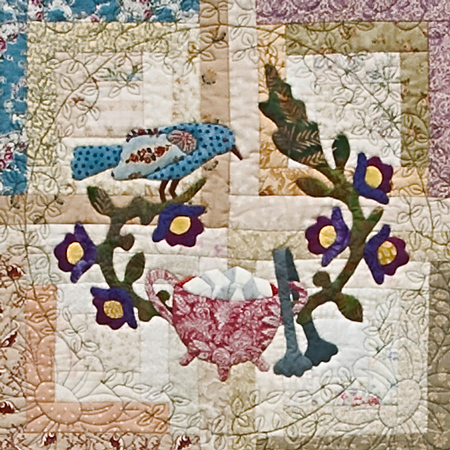 There are 12 gorgeous projects, all using interfaced appliqué either for appliqué shapes or to eliminate the need for intricate piecing. Open to U.S. and Canada mailing addresses only. And remember, if you’re reading this in your email program, clicking “Reply” is not leaving a comment. You’ll need to click over to the blog itself.